While appearing on The Tonight Show With Jimmy Fallon earlier this week, Anthony Bourdain shot a web-exclusive video in which he offered his no-holds-barred opinions on some recent, generally annoying trends in the culinary world. 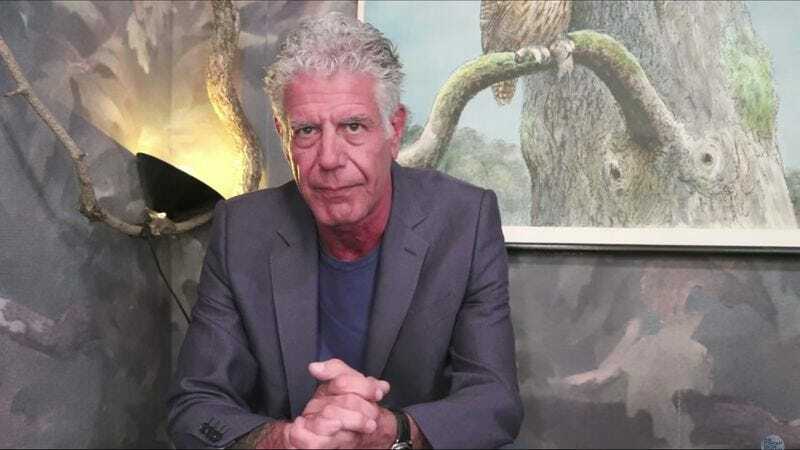 The video, which seems to have been shot in one of 30 Rock’s spare bathrooms, features Bourdain doing his traditional edgy Andy Rooney impression as he digs into such topics as truffle oil, Cronuts, and the ubiquitous brunch. If you’re familiar at all with Bourdain’s work or personality, you can probably guess which trends he finds most offensive. Overly complicated mixology routines, with their superfluous artisanal flares, really just get in the way of his enjoyment of a nice stiff drink; Kobe beef sliders are an abomination, reserved solely for the tackiest of “hedge fund managers”; and the world-traveling chef with decades in the business seems to have a really difficult time wrapping his head around the purpose of a juice bar. In the end, Bourdain advises the viewer to use these glaring examples of faux-sophistication (truffle oil, kobe meatballs, and the like) as flashing road signs directing you to stay away at all costs. Either that or take a long, hard look in the mirror and figure out where things went so wrong.